ALA Promotions president Michael Aldeguer has decided to move up undefeated and talented “Prince Albert” Pagara to the main supporting bout behind star attraction Genesis “Azukal” Servania who faces former WBA world champion Alexander “El Explosivo” Munoz of Venezuela (36-5, 28 KO’s) in the “Pinoy Pride” fight card at the plush Solaire Resort Hotel & Casino on Saturday. Aldeguer made the decision to pit the 20 year old Pagara (18-0, 12 KO’s) against the tough Indonesian veteran and WBO Asia Pacific super flyweight champion Isaack Junior of Indonesia, the 25 year old southpaw with a record of 22-4-2 with 8 knockouts after Juan Hernandez was forced to pull out of his clash with undefeated “King Arthur” Villanueva following a motorcycle accident. His replacement Danny Flores also pulled out after his handlers expressed concern he wouldn’t be able to make the super flyweight limit and was substituted by another Mexican Fernando “Enano” Aguilar who is scheduled to arrive on Thursday at 4:00 p.m. The 24 year Aguilar has a record 9-6 with 1 knockout and is coming off an eight round unanimous decision loss to Ramiro Robles last November 30 following winning a ten round unanimous decision over Jose Roberto Gonzalez on May 25, 2013. Villanueva is the reigning WBO International super flyweight champion and has a record of 24-0 with 14 knockouts. With the sudden switch in Villanueva’s opponents, all eyes will be focused on unbeaten WBO Intercontinental super bantamweight champion Genesis “Azukal” Servania who headlines the top-rating “Pinoy Pride” series of ALA Promotions and the giant broadcast network ABS-CBN with the fights to be telecast at 10:15 on Sunday morning over Channel 2. The 22 year old Servania who is undefeated in 23 fights with 9 knockouts battles former WBA champion Alexander “El Explosivo” Munoz of Venezuela who won the title from Japan’s Katsushige Kawashima on January 14, 2008. Munoz is an experienced fighter with a record of 36-5 with 28 knockouts. 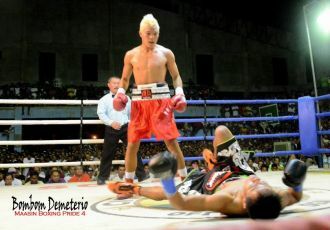 Servania is coming off an impressive 2nd round TKO over former WBA bantamweight interim champion Rafael Concepcion of Panama last October 26.